Dear Friends – Happy New Year! We pray that the New Year has opened doors to God’s marvelous works for you! At Agape House we are seeing His light shining through so many people as we all come alongside of the residents/students, in so many ways, as we give God all the praise and glory. PLEASE NOTE: We are in need of lunch servers on Tuesday, Wednesday & Thursday (29, 30 & 31 of January) due to the 5th week of the month. If you are able and willing to provide a lunch meal that week, please contact Debby at 262.275.6466. Blessings to each one of you . . . The girls have been playing many games together. It’s so sweet walking into the multipurpose room and seeing groups of girls playing card games, others playing board games and all enjoying themselves. They do enjoy beating staff at the games as well. In the home we have a level system where the students can earn privileges for different things. One girl was very surprised and excited when she learned she is moving up a level this week. She said she thought she’d never get there. God has been working so gently in their lives. It’s so neat to watch the Lord changing their hearts slowly and ever so softly. Many times they don’t even realize the changes they are making in their choices. The girls received so many wonderful Christmas gifts this year through the generosity of so many of you! 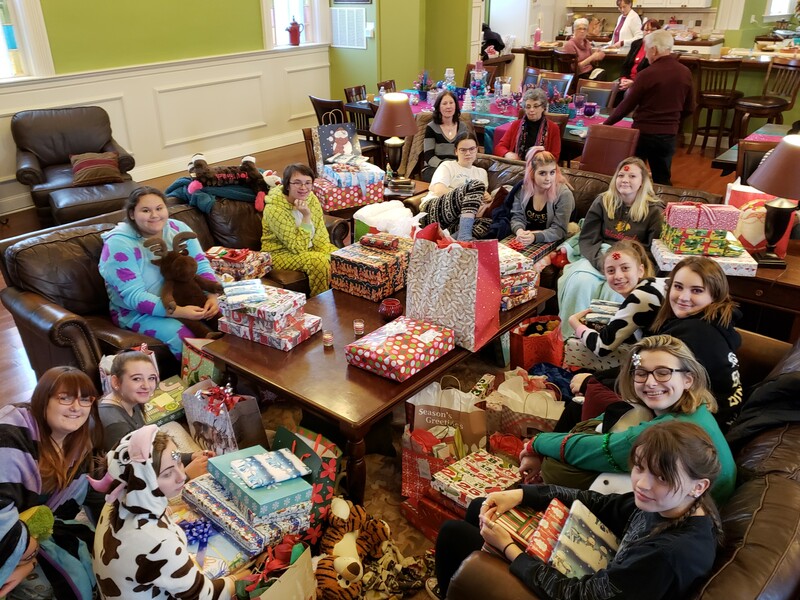 They enjoyed a Christmas pajama party to celebrate together before going home for Christmas. They were just as excited to open a box of AA batteries as they were for the games and other items! Thank you so much for your investment in the lives of our girls. You truly make a difference. As each girl becomes more comfortable with the program and staff she starts to share her heart and past. We’ve had a lot of deep hurts come up lately. Please intercede for the girls. So many of them are hurting and struggling to process in a healthy way. Please pray that the girls would be able to bring their struggles to staff and that the Lord would give them the words to verbalize what’s going on. After the holidays it’s hard for the girls to face being here for six more months. They enjoy their time away from school and celebrating. Please pray for patience and a desire to continue growing and healing. Family counseling sessions are key for the healing process of our students and their families. Please pray for wisdom for the counseling staff as they bring families together to strengthen and heal.